Perhaps you are either for Damien Hirst or against him. I thought I fell into the latter category. Hirst seems to have singlehandedly turned art into a commodity on a production line scale, removed from any form of skill or craft. I wasn’t expecting much from his retrospective at the Tate Modern (until 9 Sept), allowing me to be pleasantly surprised. It came as something of a revelation to realise once again why and how he shocked the art world as a cocky young Goldsmiths student. 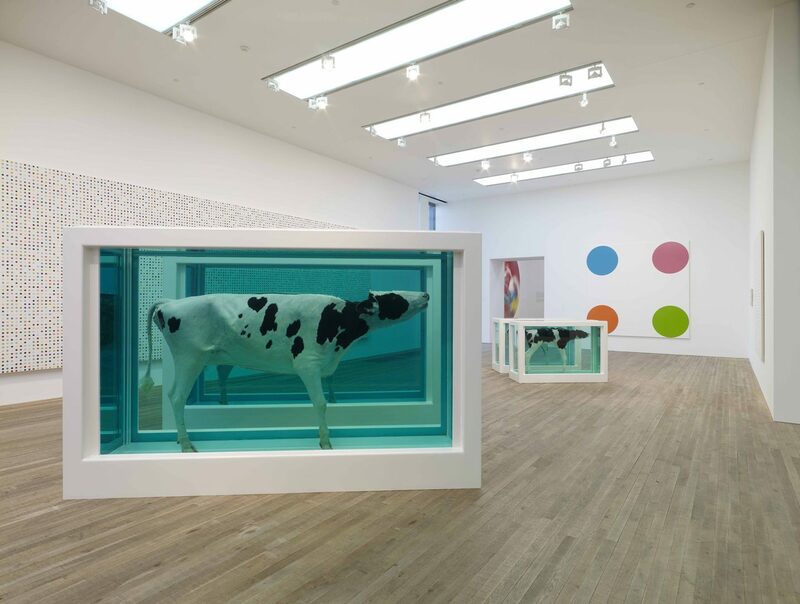 A retrospective gives one a wonderful sweep of an artist’s progression – and in his case it has given me new respect for the young Hirst’s originality, but also thrown into sharp focus just how shallow his work is now. His first spot painting is a delight – bright colours, squiffy circles and dribbling paint – a far cry from the mechanised production line of today. That first shark seems to lunge out of the tank at you, the audacity of its concept and execution making it a legitimate icon of its time. The early wooden cabinet with his granny’s pills has a human touch that the rooms filled with sleek metal cabinets, surgical steel instruments and doctors’ dummies don’t. The disgusting vitrine of the flies, zapped to death or feasting on the blood of a dead cow is clever black humour, but by the time you get to the real live butterflies you begin to wonder whether the Natural History section doesn’t belong somewhere other than an art gallery. True, the stained glass panels with butterfly wings are exquisite – probably the only thing of beauty in the exhibition. There is a stark contrast between the sheer bravura of his early work, and the tedium of his current crop. Hirst talks about his fascination with the endless repetition of a theme, encapsulating why his work elicits boredom. Just how many more spots can he make – or rather produce? It’s as if he now has six different motifs and simply uses them in varying sequences. There are spots, cigarette stubs or ashtrays, pill cabinets, flies, formaldehyde and most recently, bling. So there are spots made of dead flies, cabinets with cigarette stubs and butterflies with zirconas. It all blurs into one final room of golden excess fit only for an oil sheikh’s mansion. This is a superbly edited show by the Tate and one is very aware that the curators have pared away most of the forgettable excesses. In the process though, they may have heightened the sense of repetition. Even the diamond-studded skull, that point where death and money join together, is easier seen in reproduction. For gallery details, click here. ← What is Quintessential British Design?